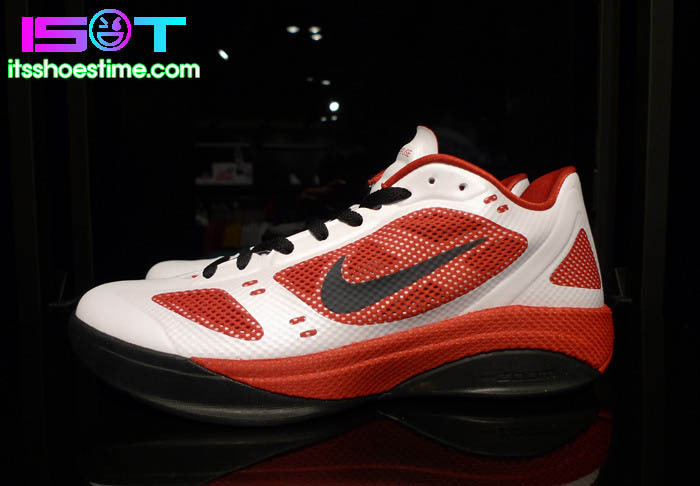 While the Nike Zoom Hyperfuse 2011 Low will launch alongside the mid-cut variation in two weeks, here's a colorway that will be released next month. While the Nike Zoom Hyperfuse 2011 Low will launch alongside the mid-cut variation in two weeks, here's a colorway that will be released next month. The shoe features a white synthetic base with red working mesh panels along the side and the inner liner. Contrasting black is used for the laces and Swoosh logos. Finishing off the look below is a red midsole and black rubber outsole. Look for these to drop sometime in August.